MANCHESTER, England (CNS) — The birth of the royal prince is a “source of joy” for people around the world, said the president of the English and Welsh bishops’ conference. Archbishop Vincent Nichols of Westminster issued a statement of congratulations to Prince William and his wife Kate, the Duchess of Cambridge, on the birth of their first son, who is third in line for the British throne. “On behalf of the Bishops’ Conference of England and Wales, I would like to congratulate their Royal Highnesses, the Duke and Duchess of Cambridge, on the birth of their son, his Royal Highness, the Prince of Cambridge,” the archbishop said in a July 23 statement. “The birth of the new prince will be a source of joy not only for the royal family but for the peoples of the United Kingdom and beyond,” said Archbishop Nichols, president of the Bishops’ Conference of England and Wales. The archbishop promised prayers from the Catholic Church for William, Kate and their new son, whom they named George Alexander Louis. “May Our Lord Jesus Christ bless and protect them, and may the prayers of the Blessed Virgin Mary and St. Joseph intercede for them,” he added. 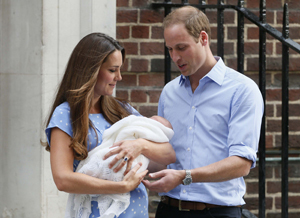 The baby was born at 4:24 p.m. local time July 22, weighing 8 pounds, 6 ounces, at St. Mary’s Hospital in London. He is the first child of the couple, who were married in Westminster Abbey in April 2011. The prince is the grandchild of Prince Charles, heir to the reigning monarch, Queen Elizabeth II. Meanwhile, gun salutes sounded across London to mark the birth. Such military salutes traditionally honor the birth of every prince or princess, no matter where their place is in the line of succession, the Ministry of Defense said. The last royal salute for a birth was for Princess Eugenie in 1990. The bells of London’s Westminster Abbey tolled for three hours beginning at 2 p.m.
Anglican Archbishop Justin Welby of Canterbury said in a July 22 statement that he was “delighted” by the birth.